While its true that I am a superhero (a low profile one, ehem), fact of the matter, I am also a wizard (in local dialect the term is aswang, lol). Wanda Maximoff are you my mommy? Cool, my grand daddy is Magneto and mah unca is QuickSilver, yehaw! It's soo Brotherhood of Evil Mutants. I love it, lol. Now, do you know when I was in Hogwarts - I was a very close buddy to the red head twins. Yeah, I'm the one they always bullied (lol) and they treated me so special that they personally picked me and made as the test subject every time they need a tester for their new joke items. I swear, I have grown a lot of heads and mind you not just the up and under heads but everywhere. Its way too cool if you ask me, although at times I need to find my other ear somewhere down the dungeon or to the Forbidden Forrest or that vacant boy bathroom where Myrtle frequently wailing and moaning, oh the horror (lol). I knew Harry from then but I thought he's a lame-o, so I would just say Hi to him. Although I must say he's really nice and can catch anything with his bare hands. Oh the best seeker, I've ever known in my wizarding life, lol. I'm just carried away, lol. The COMC (Cleaning Out My Closet) Saga continues and this time, its the boy who lived. Well, it's too late to hide but yeah I am a Potty head. So what now, lol. And like the Twisted series, I have all the Potter books too. 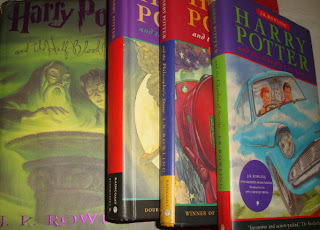 My first three is in UK versions while the Goblet of Fire to the Deathly Hallows are the US version. For curiousity sake, I had pestered a friend from Canada to buy me a UK version. Although I'm a dugong bughaw (Blue-bloodied, lol) I'm not really friend with Queen Elizabeth or the Duchess of Wales (Oh bless her soul) haha, so I cannot ask someone to buy me a Potter book in London. My UK version are composed of the first three books, reprinted in Canada by Raincoast Books. And unlike the US version the UK version is quite bland, I mean like English are - in real life, lol. US version from Scholastic are very kiddie with pictures in every chapter which I thought cool, huh. And here's the catch, the only difference between the two versions is the title of the first book, in UK - it's The Philospher's Stones while the US preferred The Sorcerer's Stone which for me the UK version is more catchy. From the Goblet of Fire, I switched to the US version and the book is damn heavy, you could die if someone would throw it and knocked it off to your head. In its 5th book and due to the popularity, National Book Store started to accept reservation for advance copy. I have a friend who also a die-hard Potter. So we would always be the first to placed our reservation until the Deathly Hallows. Can you imagine the feeling knowing that before a US fan having a grasp of their copy, we on the other hand already finish the book. That's right, from book five to book 7, the average time to complete reading the whole book is 13 hours. So when we calculate that in Philippine time. Let see, from NBS you started a very long queue by 10:15 AM assuming a 15 minutes lead time prior to opening the store is effected. Then, another 45 minutes to get your copy and another 1 hour to get you to your home. A five minutes to change your clothes. Ofcourse, you won't even noticed you are starving so eating is not applicable here. Hello, never experience to be excited? Lol. 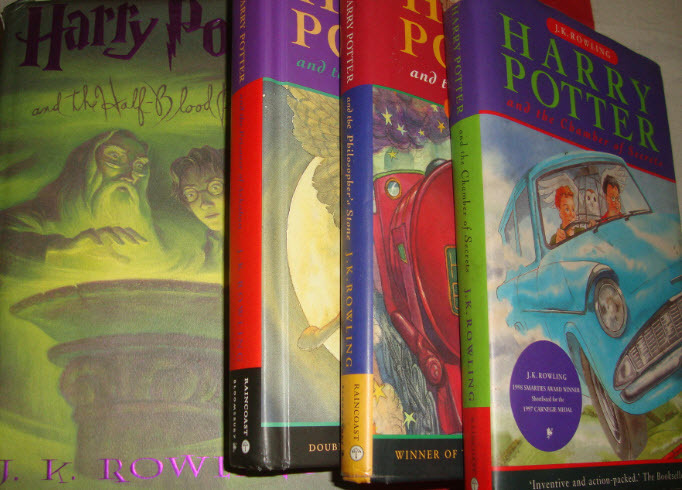 It's roughly 15 hours to complete the HP task, from getting the book to finishing reading it. Assuming we started at 10 AM PI time or 8PM in the US, so at 10 PM in the US, or 2AM in PI where melatonin level is high and yet here you are just like being E'd (ecstasied, lol), savoring every scene, and in one or two occasion you would hear your self, shouting with Avada Kedavra, lol. Now that I am a graduate, it's time to let go of these books. Who wants a copy of these HP books? Lol. I'm a big boy now, it's time to learn big boy stuff. Hmn, how about a monster truck. Or terrorism? Oh bloody Jihad! I never thought of that before, lol.